Who in their right mind would want to spend all their time and energy washing a car if they didn’t have to? Who would want to pay 30 bucks for someone else to do it? Nobody. That’s who. Well, thanks to Nissan, washing cars might actually be a thing of the past. Yes, that’s right Nissan is planning on implementing a new paint, known as Ultra-Ever Dry, that is able to self-cleanse, which have been tested on Nissan Notes over the past few years. The Ultra-Ever Dry paint was originally developed by UltraTech International Inc. and is able to self-cleanse by maintaining a thin layer of air over the paint that deflects water, mud, and grime. This is made possible through what is known as super-hydrophobic and oleophobic paint, which of course, have been formed through the most up to date research and technology. “The Nissan Note has been carefully engineered to take the stress out of customer driving, and Nissan’s engineers are constantly thinking of new ways to make families’ lives easier,” said Geraldine Ingham, Chief Marketing Manager for Nissan Note. Now that the technology has been perfected, Nissan is working on bringing the paint to future Leaf models (there is no time table, but it could be available as an aftermarket accessory very soon). The Leaf, in case you forgot, was also the first modern electric vehicle to be produced and sold by a major manufacturer. 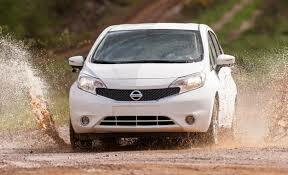 The combination of self-cleansing paint and electric powering has even started a new selling campaign for Nissan. This entry was posted in Culture and tagged clean, leaf, Nissan, paint, self cleansing. Bookmark the permalink.